I was sitting outside the caravan when I heard a continual splashing in the water. After several moments passed and realizing this was not the usual wash from a boat I walked round. To my surprise I saw what I believe to be the Loch Ness Monster. My son and I stood looking at this creature in amazement. Although I was terriﬁed, we stood and watched until it submerged, which it did very quickly causing waves to break on the shore. We had an excellent view as it was so close to the shore. Its skin was dark in colour and looked very tough. The neck was long and held erect. The head was about the same width as the neck. There were two projections from it, each with a blob on the end. This was not a pleasant experience. I certainly never want to see the Monster again. My son had drawn several sketches, one of which I enclose. I was so taken up with the strange appearance of the head and neck that I did not examine the rest of the animal at all closely. There were two or three humps and the total length visible would be about 15 feet. The neck was held erect, and where it met the water it enlarged to join a bulky body. The head and neck together were 2—2.5 feet in length, the head alone being about 6 inches long and of about the same width as the neck. What astonished me, apart from the hideous appearance of the head, was that there were two 6-inch-long projections from it, each with a blob on the end. The skin looked black and shiny and reminded me of a snail more than anything. Mrs. Finlay's experience was first recorded by Constance Whyte in 1957 for her book but Dinsdale interviewed her about eight years later while he was researching his book. Here is the drawing her son Harry sketched for Whyte's book. The reaction of Mrs Finlay to the sight of the creature was one of being terrified and paralysed with fear. Now the critic who thinks Mrs. Finlay only saw a deer would merely retort that once someone has convinced themselves that they are looking at something unusual then such a reaction will naturally follow. This may well be true but the fact that her son reacted in the same way diminishes that argument. In fact, according to Dinsdale, the lad gave up fishing after this episode. The episode is placed about half a mile south of Aldourie Castle at the old pier and the creature was about twenty yards out in the water. This kind of sighting is much loved of debunkers. It gives them a chance to dismiss a dramatic sighting and then turn round and say "If such a close up report can be dismissed, then what about the more distant ones?". To that end, the three sceptics I normally consult (Binns, Burton and Campbell) are unanimous that it was nothing more than a reddish brown deer. They cannot pass up on this opportunity to bolster their case. In fact, Maurice Burton was so convinced that he also reproduced a drawing in his book of what a young buck with short stumpy horns would look like at that distance. Not surprisingly, the drawing he executed looks exactly like the Finlay drawing but with the eyes, nose and folded back ears. He even tries to explain away the grey, leathery appearance of the creature's skin with reference to the water's glistening effect. Now finding an image of a deer on Google Images that looked like Burton's was totally fruitless. The best I could find was the two images below. The "22" near the centre is where the pier is drawn and indicates a sounding depth measurement done by the survey. It has a depth of 22 feet just over twenty yards out. In other words, too deep for a deer to stand in. This is to be expected because there is a pier here and some kind of depth is required for boats to safely approach the mooring point. The "6" (6ft) to either side of the pier is perhaps what Burton intended but a deeper depth is required when deciding where to put a pier. Apart from this problem, there is the other issue that the creature is reported to have submerged after some seconds. Not one of the three sceptics addresses this point. 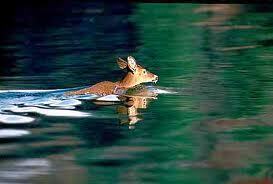 Deer do not submerge and disappear under the surface (unless dragged under the surface by the Loch Ness Monster). If this was a deer then it would have remained in sight for a long time or clambered onto the shore. Either way, it's identity would have quickly become apparent. Perhaps the deer was having a heart attack and fell dying into the water? This is one ridiculous interpretation I have heard and again we see how on examining the sceptical case, things begin to fall apart. What Greta Finlay saw terrified her, her son gave up fishing because of it. If it was a deer, this would have become apparent fairly quickly as the deer did its normal thing in water. As additional information, here is a Google Earth zoom of the pier with the circled area where I believe the witnesses were and the general direction of the beast. No options for a deer to covertly disappear behind an outcrop or dash onto shore. Again with skepticism, it is the plausible versus the possible. A deer sounds plausible but given an examination of the facts not probable. Some may suggest a strangely floating deer fooling someone 20 yards away whilst having a coronary is still more probable than a large unknown creature in Loch Ness. At least the monster theory does not involve some strange gymnastics to force the deer to fit the data. So the Loch Ness Monster again submerged back into the waters leaving people perplexed and mystified as to what it is that lies in those dark depths. Approval was given by the Highland Council yesterday for both Jacobite Cruises and the Loch Ness Centre developments to go ahead near the Clansman Hotel. Now I hoped that only one at worst would be approved especially considering both sites are only a few hundred yards apart. But in a typical example of local government inefficieny, they pick both. Clearly (to me at least) this means that one of them will eventually go under as there will be too few customers spread over such a short distance. Competition dictates one will win in the end and millions would have been wasted as the other folds. Of course, I may be wrong on that score but we shall see how this pans out in the years ahead. My bet is on the one with the most cash reserves to sustain loss leading products in undercutting the competitor. One presumes there are two reasons why the Highland Council choose both. The first is to create local jobs in this time of economic uncertainty. But that will be a temporary effect when we consider the other reason and that is increased tourist numbers to the Highlands. Once again, economic duress and high oil prices dictate that more people will currently stay in the UK for their holidays. That too will be temporary. As people's disposable income recovers and oil prices stabilise, they will be off once again to foreign climes and our two cheek-by-jowl centres will be at each other's throats slashing prices to the bone and laying off staff in a desperate dash for a dwindling customer base. Political expediency versus economic common sense. When did the two ever meet? Of course, there may be a third reason they were both chosen and that is a lawsuit from the losing party because their plan was just as good as the other one. That won't happen now. And all this during a time when Nessie sightings are down and Nessie skepticism is high which proves to me that the main reason for all this is to cash in on a temporary increase in visitor numbers. I for one will avoid all three like the plague and support smaller businesses in the area.